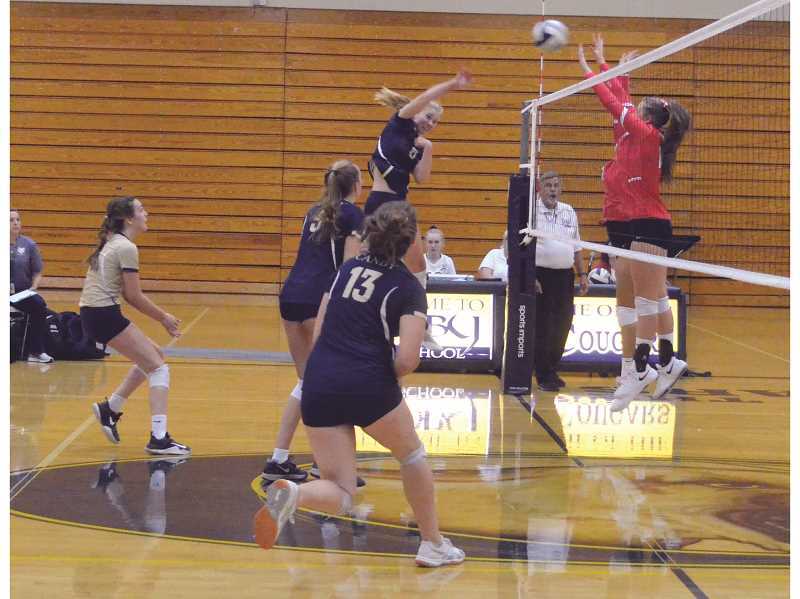 CANBY—The season has been tough for the Canby volleyball team. After graduating and transferring several key members of last year's team, head coach TJ Schlatter has been rebuilding the squad with a variety of different players, trying figure out who plays best where. While the season is not over yet, it appears that a winning formula was found. After dropping four straight games, the Cougars overcame the visiting Oregon City Pioneers 3-0 on Tuesday, Oct. 2 with scores of 26-24, 28-26, and 25-22. After that, the team defeated Tigard on Thursday, Oct. 4 in a rematch 3-1, with scores of 23-25, 25-22, 25-11, and 25-16. "Coming into a game off of four losses isn't easy, but honestly I don't think anyone felt too much pressure," junior captain Ruby Kayser said. "We had a great week of practice and everyone has been working really hard. Before the game in our huddle I told the team, 'We aren't losing tonight.' I think that we just had a mentality that we weren't going to accept another loss." The win pushed Canby to 4-6 in the Three Rivers League (TRL) and 5-8 overall. Oregon City is now 5-5 in the TRL, and 8-7 overall. Tigard meanwhile is 2-8 in league play, and 4-11 overall. "I was super proud of their effort tonight, it was a team effort," Schlatter said. "They stayed together. They've been struggling with that a little bit, creating that team dynamic, so this was really good to see." In the game against Oregon City, it was Canby battling tooth and nail to keep the Pioneers at bay, and ended up doing so. With the game tied at 24-24, Oregon City hit the ball out of bounds, and Canby got the next point to seal the deal 26-24. In the second set, Canby fell behind in the early going, falling behind 8-10. The Cougars went on a 6-2 run and took the lead in the second set. The two teams stayed neck and neck, tying up at 20's, 24's, 25's, and 26's. The last four Canby points came from sophomore outside hitter Daley McClellan kills. McClellan had 22 kills on 42 swings. Canby won the second set 28-26. "Daley came back and did her thing," Schlatter said. "She's the best outside hitter in our league for sure because she's an amazing serve-receive passer and she makes our setters better because she can hit anything they put up. So we rely on her a lot, more than I wish we did, but she carries the load with a lot of maturity. She provides a lot of energy and fun kills." "My jumping isn't very good because I've been out for two weeks and not doing anything," McClellan said. "Just kind of remembering the rotations is also tough. I'm watching the games, but putting myself out there, I needed to work on the rotations a bit. I need to work on my shots too, I haven't hit in a while." McClellan, who missed two weeks' worth of play due to injury, was a welcome offensive presence along the net for the Cougars. In her absence, setter Kayser was moved into an offensive role, and junior Melissa Guijosa Mondragon has stepped into the setter position. "We mix it up a little bit based on a couple of things, and I think it worked well," Schlatter said. "Against Lake Oswego we ran a 5-1 with Melissa, trying to get more hitting with Ruby, but she's such a good setter and runs the offense so well that it showed tonight how valuable that is. Melissa set really well tonight too, not having to carry the whole load helped her settle in and do the job she needed to do." The third set had Canby get up early thanks to a kill by Kayser, but again Oregon City persisted. The Pioneers got up early with a 4-6 lead, but Canby overtook the visiting team at 10-9, and never gave up the lead again. The Cougars never got too far ahead, but ended up closing the deal 25-22. "It was very important to have a decisive three set win," Kayser said. Kayser had 10 kills off of 21 swings, and set the ball 26 times. "Spirits were low after the four losses, but a three set sweep really gave us momentum. I'm excited for the rest of the season because I know we will take the energy from tonight and bring it into the second half of the season." The team that started so hot last season appears to finally have its feet under it. While the mental challenge has been difficult, it is something the team is actively working on. "We're working on talking overall," McClellan said. 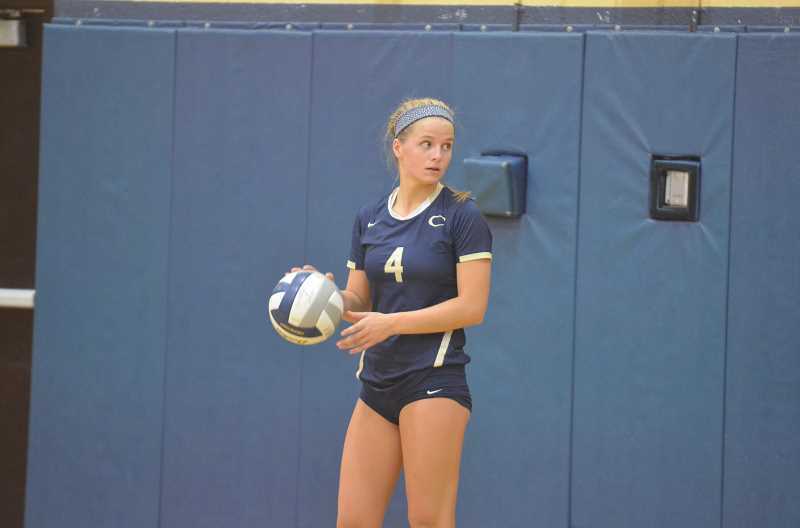 "It's a huge aspect in volleyball, just knowing where everyone is and calling shots. Lifting each other up and encouraging each other, that keeps us positive and happy throughout the game. It also helps us play hard too." Up next for the Cougars is a rematch with St. Mary's Academy (2-8 in the TRL, 4-10 overall) on Tuesday, Oct. 9. Canby won the first matchup 3-1.